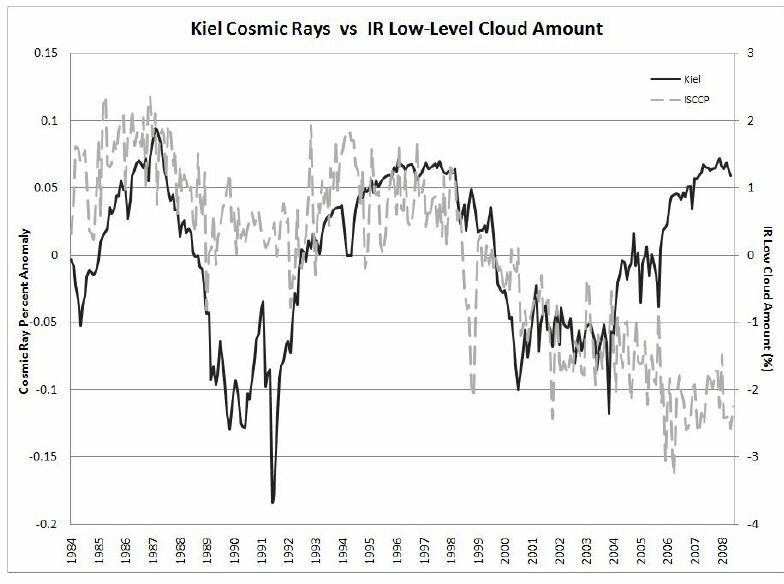 Over the period 1984-2008, cosmic ray variations (solid line) from a neutron counter at Kiel, Germany, are compared with cloudiness in the lower troposphere reported by ISCCP (broken line). Note the mismatch 2005-08. Agee et al. 2011, © American Meteorological Society. And their abstract reads: An updated assessment has been made of the proposed hypothesis that “galactic cosmic rays (GCRs) are positively correlated with lower troposphere global cloudiness.” A brief review of the many conflicting studies that attempt to prove or disprove this hypothesis is also presented. 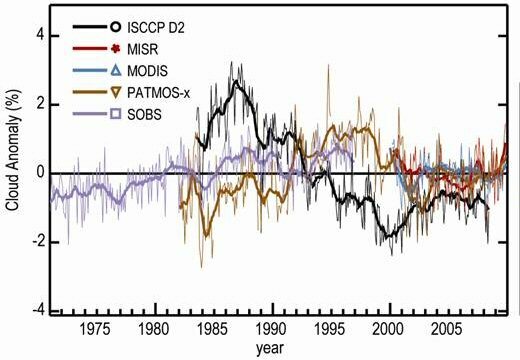 It has been determined in this assessment that the recent extended quiet period (QP) between solar cycles 23-24 has led to a record high level of GCRs, which in turn has been accompanied by a record low level of lower troposphere global cloudiness. This represents a possible observational disconnect, and the update presented here continues to support the need for further research on the GCR-Cloud hypothesis and its possible role in the science of climate change. There’s glory for you! – meaning a fine knock-down argument, as Humpty Dumpty said to Alice. To uninformed eyes (meaning, sadly, most climate scientists and commentators) the graph looks like a devastating falsification of the Svensmark hypothesis. Readers might even be surprised by the cautious language in the abstract, about a “possible observational disconnect”. In fact the authors have every reason for caution. The conspicuous downward trend in the ISCCP cloud data is almost certainly unreal. An expert view is that it results from changes in the operational status of the satellites from which the data are pooled – see the references below to Campbell 2004, Campbell 2006 and Evan et al. 2007. If a satellite views clouds from a slanting angle it sees more low clouds than when it’s looking straight down. Changes in the population and orbits of satellites contributing to ISCCP data have tended to narrow the viewing angle to nearer the vertical. That will have reduced the reported cloudiness even if, in the real world, the cloudiness were unchanging or even increasing. The effect is seen in these early maps from Campbell. Upper map: the trend in cloudiness from July 1983 to September 2001 across a grid box with 280 km squares, from the official ISCCP data with the annual cycle removed. Lower map: adjustment for the changing viewing angles of the satellites greatly reduces the areas of supposed loss of clouds (in blue). Campbell 2004. The harsh fact is that supposedly real observations of clouds over the decades are in a state almost as parlous as the IPCC’s contradictory computer models of climate. Here is a summary of observed monthly cloud “anomalies” (i.e. variations) in five different data sets, published by the American Meteorological Society (ref. Arndt et al. 2010, see below). Violet: SOBS Cloud amounts from surface weather observations 1971-1996. In each case the solid lines are 12-month running means. The data on cloudiness over the longer term will be improvable by retrospective number-crunching, with PATMOS-x leading the way for total cloud. I’m very encouraged to see, in the last plot above, that PATMOS-x (brown) provides almost a mirror image of the ISCCP variations (black). But the low-level cloudiness may be more difficult to improve. It’s perhaps needless to say that none of these is to be found in Agee et al.’s paper. I’m promoting to the start of a new post a comment on an earlier post that came from Terry Sloan, together with my reply and his comment on my reply. I’ve included a graph that he sent in an e-mail because it wouldn’t upload into the Comments section. After that, the discussion continues here with further remarks from me. Added 12 June 2010: There is now a thoughtful reply from Eimear Dunne. It tells of unremitting attempts to falsify the Svensmark hypothesis by claiming that there’s no important effect on global cloud cover when eruptions from the Sun briefly cut the influx of cosmic rays, in “Forbush decreases”. The centrepiece is a summary of results published last year by Svensmark, Bondo and Svensmark. They show very plainly, in observations of the real world, that Forbush decreases have big impacts both on aerosols (chemical specks that grow into cloud condensation nuclei) and on low-level clouds. That earlier post continues with the efforts in 2009-10 by Wolfendale and Arnold and their collaborators, who try to deny the Svensmark group’s result, by using relatively weak Forbush decreases. Svensmark can explain exactly how the impacts in those cases are masked by quasi-random meteorological noise, like tigers hidden in a jungle’s undergrowth. 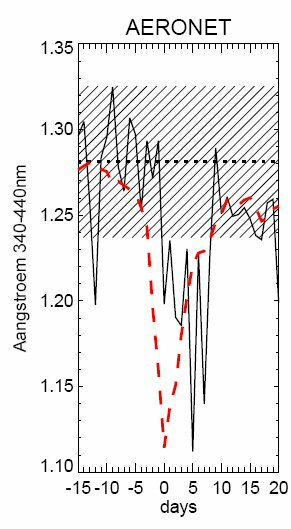 Real-world results by Svensmark, Bondo & Svensmark (2009) for the remarkable loss of fine aerosols from the atmosphere (black curve) following five strong Forbush decreases in cosmic rays (red curve). Each aerosol datum point is the daily mean from about 40 AERONET stations world-wide, using stations with more than 20 measurements a day. New nonsense comes in an abstract posted on the CERN website. It’s for a paper by researchers at Leeds, to be presented at a meeting about aerosols in Helsinki in three months’ time. At issue are the Svensmark team’s results on aerosols (see right). These show fine aerosols disappearing from the sky, because the shortage of cosmic rays lessens the chemical production of the clusters of sulphuric acid and water molecules that seed the aerosols. According to the people in Leeds, that can’t be right because they have a computer model that contradicts it. The GLOMAP model was developed by Ken Carslaw, and the unlucky person named as lead author is a graduate student, Eimear Dunne. Is the recent warming of Greenland unprecedented? The strongest reasons for doubting the man-made global warming hypothesis come from pre-industrial climate change. During the past 10,000 years, since soon after the end of the last ice age, there have been bigger ups and downs in global temperatures than during the 20th Century. Yet according to the IPCC, citing measurements of gas trapped in polar ice, the concentration of CO2 varied by only about 20 ppm throughout those 10,000 years – less than a quarter of the change during the 20th Century. So whatever caused the pre-industrial climate changes, it was not CO2. The record is well accounted for, in fact, by (1) a change in the Earth’s attitude in orbit, which brought a gradual cooling to the Northern Hemisphere, and (2) solar variations that superimposed on that trend a succession of warmings and coolings. Yet to offer such natural explanations for past events does not logically falsify the man-made global warming hypothesis, because its supporters say it represents an important new factor in climate change. If increasing CO2 had no effect whatever on the climate, that might be surprising, but the claim of the hypothesis and its computer models is that the new contribution from man-made greenhouse gases has become the main driver of recent climate change. Implied here is a falsifiable statement, namely that there is something very unusual about the recent warming of the world. That is certainly the sense of many scientific and political pronouncements about global warming. Introduction: Is climate research a real science? Here’s how the philosopher of science Karl R. Popper explained how to disitnguish a real, or ’empirical’, science from a pseudo-science. 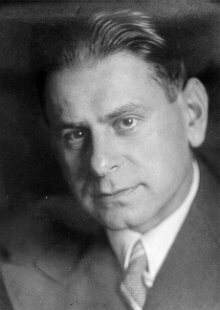 Popper: Logik der Forschung 1934. In English, The Logic of Scientific Discovery 1959. I shall certainly admit a system as empirical or scientific only if it is capable of being tested by experience. These considerations suggest that not the verifiability but the falsifiability of a system is to be taken as a criterion of demarcation. In other words: I shall not require of a scientific system that it shall be capable of being singled out, once and for all, in a positive sense: but I shall require that its logical form shall be such that it can be singled out, by means of empirical tests, in a negative sense: it must be possible for an empirical scientific system to be refuted by experience. Hence the statement, “It will rain or not rain here tomorrow” will not be regarded as empirical, simply because it cannot be refuted; whereas the statement, “It will rain here tomorrow” will be regarded as empirical. A series of postings under Falsification Tests in Calder’s Updates will compare results for the man-made global warming hypothesis and for Henrik Svensmark’s cosmic climate hypothesis about cosmic rays and clouds. Although the Svensmark hypothesis is quite recent (1996), it’s a fresh version of a much older and more general solar hypothesis, that the Sun is responsible for climate change over years, decades and centuries. From its origin with William Herschel in 1801, the idea that copious sunspots mean a warm climate and a scarcity means a cooler climate was the leading hypothesis for nearly two centuries. The solar hypothesis was supposedly falsified in the 1980s when the SolarMax satellite measured the variation in the Sun’s brightness during a solar cycle and found that the changes were too small to be very influential on the climate. That is still the official position of the Intergovernmental Panel on Climate Change (IPCC), but the verdict flew in the face of abundant historical evidence for solar-driven climate change. The Svensmark hypothesis soon provided a mechanism for greatly amplifying the influence of the Sun’s variations. As for the man-made global warming hypothesis, its adoption by an influential group of climate scientists is also a recent phenomenon. Writing in Scientific Europe (ed. Calder, 1990) the first chairman of the IPCC, Bert BolÍn of Stockholm, recalled that the idea that human beings would alter the Earth’s climate by releasing CO2 was neglected or disbelieved by most climate scientists from 1896, when Svante Arrhenius pointed out the possibility, until 1988, when a meeting of experts in Toronto called for a curb on CO2 emissions. What changed their minds was mainly the big increase in computer speeds. It enabled the development of ever-more elaborate models to simulate the climate for decades ahead, on various assumptions. The continuing reliance of the man-made global warming hypothesis on the computer models is important to remember. As they assume that positive feedbacks amplify the rather small direct greenhouse effect of CO2, the models easily generate alarming predictions of big temperature rises as CO2 increases. And they are endlessly adjustable. Medieval astronomers, who believed that all heavenly motions had to be ideal circles, were able to match the imperfectly measured motions of planets by adding epicycles. Similarly, climate scientists can tweak the models to deal with criticisms and would-be Popperian falsifiers keep finding the goalposts moving. In any case, different models give a wide range of different predictions, both globally and regionally. The man-made global warming hypothesis thus comes perilously close to “It will rain or not rain here tomorrow”, which Popper said is not empirical, because it cannot be refuted. While this slipperiness may be handy for the “warmists” to score temporary debating points, it would leave them with a pseudo-science if there were not some features of the hypothesis that remain open to tests. Many critics wish to refute the Svensmark hypothesis. Their tests will be evaluated too, starting with claims, much publicized over the past few years, that changes in cloudiness fail to follow sudden changes in the influx of cosmic rays. In such a contentious area I must of course declare an interest, as co-author with Svensmark of The Chilling Stars, which explains his hypothesis. Do temperature changes follow CO2 ? You are currently browsing the archives for the 3c) Falsification tests category.